I thought I would share a smile that artists who have been on workshops may recognise. Over the years we have all been on workshops at some point or another. Many inspire us,some we are disappointed with but we always without fail learn something from them. In many cases you have heard of an artist, admire their work and contact them to book a place. You are thrilled to find they have a slot and you book accomodation making arrangements for your stay and then eagerly look forward to the event. You plan your route and get there in plenty of time to set up and meet the fellow artists attending. And then in this case you wait and wait for the grand entrance of the main star who finally walks in, coat over shoulders with a curt nod to the class. The " How lucky you are to be in the same room as me " attitude fills the air! The artist then comfortably sits at their demonstration area and the vast class has to huddle around for a chance to peep through arms or over heads to get a glimpse of the brush hitting paper. Here you realise being six foot tall could be a terrific advantage. Or possibly having the build of an all in wrestler could help to push others out of the way. I have neither height nor build! Standing on tip toe I still can hardly see but gradually I manage to get a position where I can and we all watch mesmerised for the first thirty minutes. After an hour concentration started to obviously diminish. After an hour and a half everyone was feeling eager to have the chance to paint too. The initially interesting "life story" was fast losing the groups attention and I was certain that the two gentleman to my left were falling asleep on their feet! Suddenly the door to the room opened and someone who had got lost on their journey arrived with a red face of embarrassment and apologies for being late. They tried to explain there had been a car crash but at this point our " star" was furious and told the latecomer off suggesting they sit quietly at the back of the room until the afternoon session. The latecomer was almost reduced to tears and an uncomfortable silence fell on the studio. We had almost twenty minutes until lunch where we were finally allowed to paint and the "star" disappeared. This was where chaos began. With our elbows touching we were physically crammed into spaces to work. The light was so bad everyone raced for the only section of the room with windows. Those who could see what was about to happen raced to the back to get more space assuming they could do without light but needed elbow room! This was like a comedy show but without laughter! Tip: Always ask how many will artists be in a workshop and what the facilities are like! During lunch we all imagined what we would be painting that afternoon. So fully rested after our break we headed back to our positions and picked up our brushes. This is where the demonstrating artist eventually appeared and started walking around the room "correcting" paintings to the point they were now completely beyond recognition of the attending artists own work. But they did get to leave with a free painting! However I discovered as the demonstrating artist came nearer to me I found I was beginning to feel rather possessive about my work.So like a child in primary school I almost huddled over it when they arrived thrusting a scrap of paper in their direction asking them to show me how they would approach my subject without letting them touch my own which I was really pleased with as it was! I could turn this into a marathon post as a blog entry but I will simply add that a few of the artists left before the first day was over and several did not return the following day. They had " had enough" like the above painting. They disappeared into the sunset never to be seen again. The demonstrating artist although brilliant at painting was not a natural teacher. There is a mix between getting ideas across and encouraging others to paint. There is also a way to be inspiring whilst demonstrating. It is an art in itself which not all artists possess or even wish to possess. For me? I learned a lot this day. I learned how NOT to teach! Over time I have received many emails regarding attending workshops. I often read how nervous an artist is about attending a session even from the most established in the art world. I read comments on how others feel they are not good enough to come or how they have never been on a workshop before. Some coming are really worried about being in a room full of far better artists. Then I will hear from the artist who has been painting for years but feels stuck in a rut or the artist who has completely lost motivation. Or the artist eager to try something new. I often hear from many artists who want to come back time and time again for the adrenalin rush of being in a room full of enthusiasm.I know how they feel. I always have a sense of excitement as my own workshops draw near because I put so much into them and to be honest I gain so much from them too. 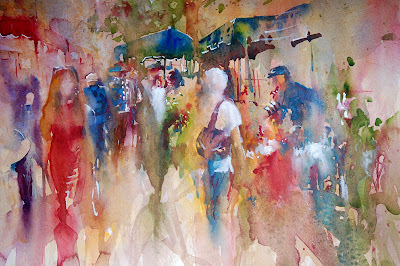 Without fail I always meet fascinating people who hold a passion or curiosity for watercolour as a medium. There are many different people attending workshops all over the world and many hold similar feelings. As it is the time of year when many exciting workshops are coming up I thought I would share a few of my thoughts. 1) Nerves. The only person who really has a reason to be nervous in a workshop is the tutor.The artist demonstrating. Every part of how the workshop is enjoyed and comes over rests on their shoulders. I usually explain this the minute my workshops start and after the first few minutes everyone is already relaxed and laughing. You see if I am not nervous how can you be? So enjoy every minute of being on a workshop and if you are nervous remember others in the room may be also but hiding it well! 2) Other Artists on the Session. Everyone has chosen to attend the same workshop because they love the artists work. Everyone is there for the same reason. To watch the demonstrator and improve. Never forget that every single artist is aware that we were all beginners once. In fact the artists with less experience are often made to feel comfortable immediately because we have all been standing in their shoes at some point. 3) Relax and bear in mind when we are painting nothing else matters. Often you could hear a pin drop on my workshops as no one is interested in what anyone elsse is doing.They are far too wrapped up in their own painting! 1) Look at the artists work and if it is what you are looking for then make a booking well in advance. 2) Be brave,book with artists who are at a higher level than you in both skill and their art journey. If you keep going to a beginners class there is a possibility you could stay a beginner for a very long time or even feel great in the group with a false impression of how good you really are. Choose a workshop level that is suitable for you but one that is always a little bit higher in standard than your own and keep stretching yourself! 3) If an artists list of workshops is fully booked ask if they have a waiting list or when their next workshops will be available. You may then be one of the first on the next schedule. 1) Arrive early and take everything you need with you. Prepare well before leaving home and ensure you have enough paper to try all you see. The most commonly forgotten item on my sessions is a water container! 2) Take all your watercolour euipment including your favourite shades. Take a few resource subjects with you in case you aren't happy with what is provided. 3) Take one or two of your own paintings and if the instructor has time ask for their opinion and tips on how to improve your work. Not all demonstrators will but it does help them to understand on which areas you can improve most. 4) Work! There are always breaks for coffee and tea and these are the times to get to know your fellow artists on the workshop. Many sessions are expensive so make the most of them by painting at every opportunity. 5) Don't interrupt a fellow artist when they are in the middle of a wonderful connection with their work. Bear in mind that just because someone isn't holding a brush doesn't mean they are not thinking about where their first brushstroke is going to be! 1) Having taken the time to choose an artist and watch their demonstrations make sure you set time to work on the new ideas when you leave the workshop at home or in your studio. Practise all you have taken in as much as possible. 2) Try to incorporate new ideas and techniques with your own. Avoid cloning! Remember no matter how brilliantly you are copying someone else this work will never be your own creation. Always aim to be unique! 3) Stay in touch with an email showing the artist your new work since the session.Let the artist know how much you enjoyed the workshop and explain if you would like a future booking. When sessions become available you may then be one of the first to know. Most importantly of all enjoy every second and let it show in your new creations! Diary of a Professional Artist. Winning Painting of the 2009 SAA Professional Abstract and Experimental Artist of the Year Category. When I painted " A La Marche" last year I had no idea where my art journey would be leading me. However 2009 turned into one of the most exciting years of my art career. In 2010 we are only into February and my weeks are flying by with so many wonderful opportunities each day that see me either constantly painting in my studio or racing to meetings. My diary is incredible and I am meeting some very amazing people.The coming months seem to read like a celebrity guest list within the art world and outside of it. My diary so far consists of. I am on one major Art Society Council and another main Art Society Commitee. This means involvement on a different level for each. I am organsing a prestigious art event for later this year which is really exciting and taking a portion of my time. It meant booking a castle as a venue and this week saw me driving to a meeting to discuss the occasion. I will be discussing the guest artist on another post on my blog soon. What they have achieved in their lifetime really is inspiring on so many levels and my trip was very thought provoking. Art wise I am working on my body of work for one main show in London and one in Hampshire which takes place later this year. I have several galleries which showcase my work and I am working on new collections for each. I also need paintings for two major events in London for April and May along with a special piece for a charity event in Hampshire in July 2010. With my art I am now supporting three major charities and will continue to do so on an annual basis.This is where my heart lies and I feel shines with my brush. I have my workshops which I keep on a personal level. My goal is to inspire and ensure every single artist attending any of my sessions leaves feeling 100% motivated and eager to paint. I aim to have new ideas in every session on technique and subjects. These are my heartbeat and often leave me inspired also. Orders of supplies and new colours for each and contact with all the artists coming from all over the world keeps me busy on a full administration schedule. 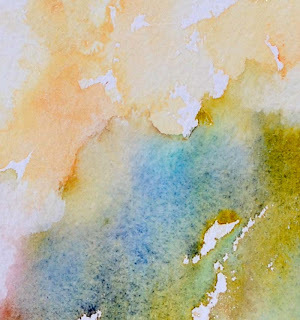 I also have requests for workshops abroad and I am looking ahead to future possibilities.USA is on my list and I am already actively looking into my first watercolour workshop there. On this note if you are in an Art Organisation and would like me to visit your country please contact me on jeanhaines@hotmail.com as I am looking at my travelling diary and plan ahead. Now is a good time to discuss future events. I am always thrilled to be contacted by art groups and societies inviting me to demonstrate or give talks. My 2010 diary is full and looking at my schedule I can see I am going to meet some wonderful groups in the future. 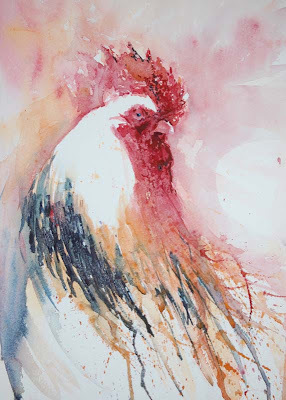 It is a terrific life to be able to meet so many people with the same passion as yourself and I enjoy each one and the chance to share my enthusiasm and love of working in watercolour. My first book " How to Paint Colour and Light in Watercolour " will be available in July this year and I am already working on my second.. There is still so much to do involved with the release of my first book so behind the scenes I am working on many areas of being an author. The idea people may have in that once the book is written "That is it" is a myth. Now the real work begins! I am also included in another book which I will share details of at a later date which will be released in USA. I have been approached regarding a DVD to go with my book and this is very dependant on a screen test which I have managed to fit in next month. This will be a very interesting exercise as I am a person who hides when anyone picks up a camera! In fact I am laughing as I type this because it really is going to be an eye opener if this adventure does eventually happen! So many friends who know me will understand what I mean. They will have experienced seeing me race to turn my head away from photography and on that note the hardest part for me with my first book was having the shot taken for the inside cover of the book! Watch this space! I feel a little bit like a juggler with many things to keep in the air but the strange thing is I love it. New opportunities keep coming my way and I find myself agreeing to them. And this is my life of being a professional artist.Whilst one commitment is completed I am already working on those further away. And amazingly taking on new ones. The most incredible part of my art career is that I am also renovating an old cottage which has seen me regularly visit my home with the need to make many decsions. It is looking beautiful and is in the final stages of internal decoration. And so a move is on the cards for the end of April. I am asked often " How do you ALL that you do?" I think the answer is you have to love what you are doing. 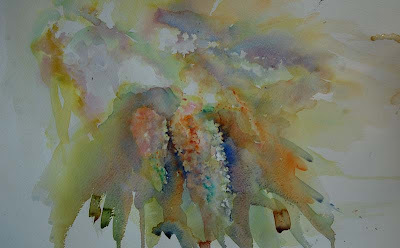 Part of a new collection to be unveiled at the Alton Spring Exhibition. 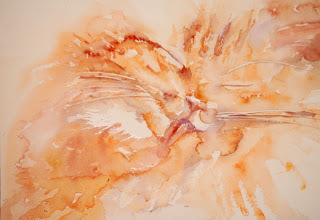 "Watercolours With Life" my main workshops cover a wide range of subjects and techniques in each session. 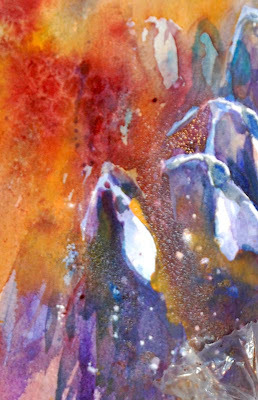 As I am not limited to one particular theme you will see everything approached in my style with both enthusiasm and new ideas on how to create a vast range of effects in watercolour. Whilst my Spring workshops are fully booked I do have one cancellation in April and a few places left in the Autumn sessions. 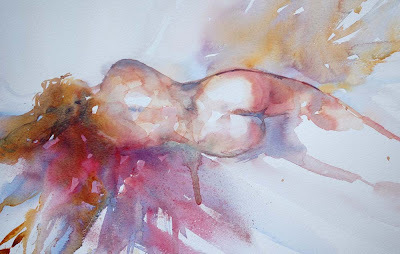 I always work on a first come first booked basis so please if you are interested in any contact me directly on jeanhaines@hotmail.com to confirm your booking. Due to a cancellation I have one place available .Please contact me directly for this very popular and exciting session. Painting beautiful golds and a selection of subjects with texture and vibrance as a main goal. All other sessions are now fully booked. Following my October sessions I will not be holding further Winchfield workshops until 2011. I am demonstrating and holding workshops throughout UK during 2010 along with visiting Norway in August. 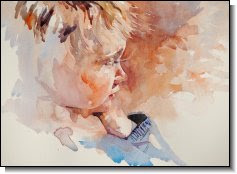 I am hoping to hold a workshop in USA in 2012 and more details on this will follow at a later date. If you wish to make a booking for a workshop anywhere in the world please contact me and I will be happy to discuss the possibility. 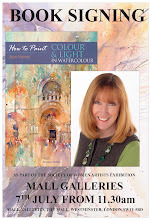 My enthusiasm, energy and passion for watercolour is endless so I will be delighted to hear from you. Amazingly it is only one week to the Private Preview of my next exhibition. It seems like only yesterdy it was the beginning of Autumn and this was a mere discussion. But here we are with a new collection and today I am at the gallery for the final details. It is amazing that when we visit exhibitions we often forget the behind the scenes preparations. The collection being put together, framing, titles and pricing. For me it is also preparation for workshops at this show and then dates for each including the Private Preview. And while this is all going on I am always working ahead to the next exhibitions. I have recieved so many wonderful requests on what subjects everyone would love to see. I have been asked if there are cockerels, elephants, dogs,cats and flowers. And a special subject that seems to disappear as soon as it hits the wall! Have my favourites in this event along with new ones and as always a few surprises. I hope everyone who visits loves my new work and enjoys the variety. And if you are reading this and coming to the Private Preview please say Hello as I would love to meet you. Invitations are available through the gallery. One of the many joys of being a professional artist is that you come across so many other artists beautiful work in group exhibitions. 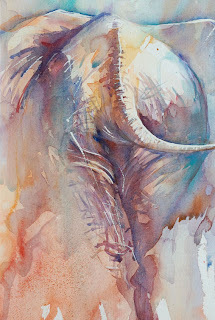 I was approached to exhibit in a gallery for a show with an " Africa " theme. I can remember being delighted at the time and took along a collection of paintings that would be suitable for the event. In this exhibition I came across the work of an incredible artist Paul Apps. His work took my breath away and still does. It is a wonderful surprise to see Pauls name as a follower and I too am now following his blog. Thank you Paul. If you would like to see art by someone who has an amazing talent please look at this link and look in awe at his wonderful work. Paul can also be found on facebook and I thoroughly recommend joining his fan page. A link to which is on his blog. Texture and Colour : Snowdrops. I am beginning to believe I do definitely see things differently to non artists. A country walk will often see me observing colour combinations and abstract shapes. This week the woodlands and country lanes are full of snowdrops in Hampshire. They are impossible to miss as my dogs and I take to the countryside for our daily breaks. But I don't see simply small white flowers surrounded by green foliage. I see the sun hitting old autumn leaves on the ground, twigs and earth each giving beautiful foundation and background colour suggestions for my compositions. Which is why I chose brilliant orange as a backdrop for this piece! 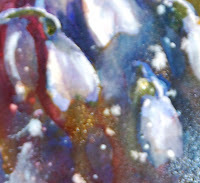 I must admit in my previous paintings I have always chosen cool violets or blues for my snowdrop collections but this has the " WOW" factor for me and I love it. It isn't finished yet but already looks so exciting. Unfinished Snowdrops A painting in progress gradually building up in texture and detail. I love one section especially. Isn't it always the way with artists to fall in love with one area above all others in every painting they create! Above : Flowers starting to come to life before the final brushstrokes. This is the area where the painting started from my imagination. You can just see a piece of clingfilm in the foreground above for added texture effects which will contrast with the bubble wrap texture below in the background area. I am having so much fun writing and working on new ideas for my next book. Many I will not include here so as to leave excitement and surprises when the book comes out! But my enthusiasm is difficult to dampen and I so love sharing my thoughts and experiments on my blog. There is so much joy and passion in every painting I create. A part of my soul touches each one with eager brushstrokes. 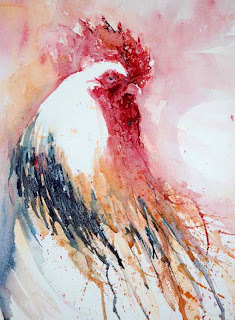 I am alive with a brush in my hand and always on the look out for new subjects and new ways to paint them. 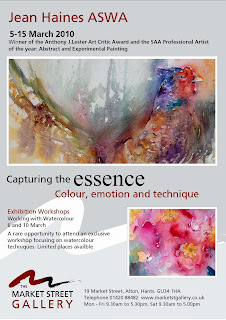 I know my enthusiasm is infectious and I eagerly look forward to my 2010 Spring workshops. I know those attending are eager to come to them too.This years will be really exciting and I cannot wait with all the surprises and techniques we are going to share up my sleeve. What a wonderful year 2010 is turning out to be! The joy of designing a garden means lots of trips to established gardens and centres to study plants. I need to understand how they grow, what light and soil suits them best and which plants will provide year round colour for my cottage. I always choose plants I wish to paint. I look at shape,colour and texture. This is how I work with my paintings also. This makes my compositions interesting. Last year I became entranced with hydrangea in its' many varieties. I bought some for a Spring workshop and loved how artists fell in love with their shape. A year later and I am still very much in love with the plant. I especially love this painting because what you can't see adds so much more impact than what you can. Study the flower in the distnace that is hardly there behind the main cluster. It says so much with so little detail. The flow of dark green through the centre brings a wonderful connection between all the individual blossoms. It started like this with the central flow in place and developed gradually. Another simple play of colours created this next study which was the start of a new addiction to my painting these flowers. Another composition and collection of ideas for future work. 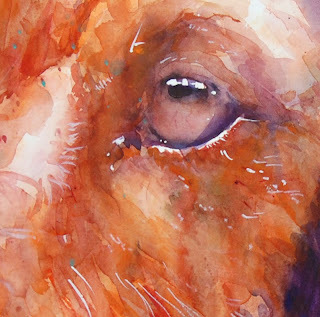 The more you study the same subject, and the more frequently you paint it the stronger the fascination appears to be. The saying " Practise makes perfect" holds true in so many ways. 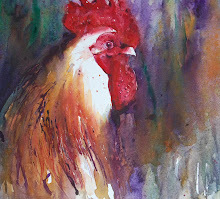 But I usually ask artists attending my workshops to only paint subjects that make them feel excitement when they pick up a brush.When you are bored with your work it really shows in the results. 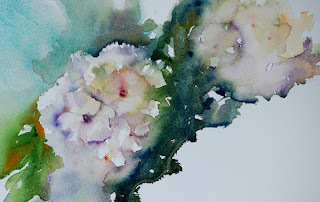 At the moment I am now in love with painting hydrangea but if you know me well you won't expect them to appear on my blog tomorrow. 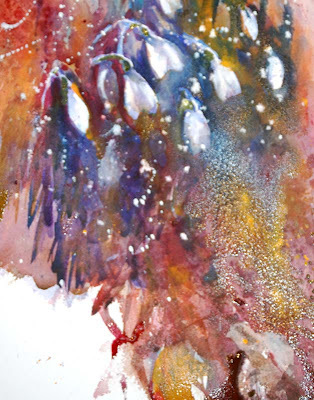 Like a thistle seed in the wind my energy and creative soul will be carried at will to the next subject and my brush will be moving eagerly to capture it with a variety of texture and colours in each piece. It is Monday, a whole new week lies in front of us to cover paper with colour.I aim to make this week the best ever in my work. My life is a blur. I have finally realised how much I was working on and how it is affecting my soul and art. I am constantly seeing Spring flowers which somehow flow into my subjects regardless as to what they are. 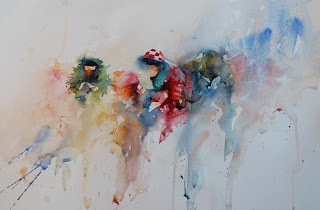 In this study of horse racing I feel my recent paintings of primroses are almost there in the distance. If you study this you will see what I mean. It is the colour selection in the background. 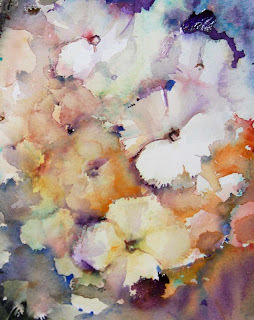 I believe I could turn sections into small flowers if I wished and what an unusual abstract that would be! 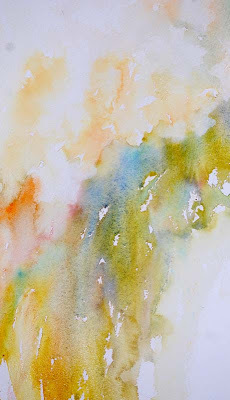 I am working on light,movement and flow in my work. I am racing to display excitement in my brushstrokes and the energy that I feel in my spirit. I want a part of me to show in each new painting which means I need to rest my artists soul from time to time to regenerate my existence in the art world. Today I aim to enjoy the beauty of nature and bring this into my paintings next week. But it is so hard to come down to earth when my heart is singing with life from an exciting new series that is magically appearing in front of my eyes. I am on what they call "A roll" and I don't want to sotp but I feel I should at least for one day. I will see how long I can last without picking up my brush this Sunday! It is far easier to share wonderful work by art friends at times than our own. 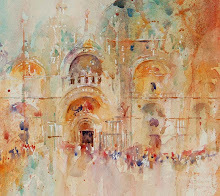 I have exhibited with Arina Gordienko on several occasions and her work really does take my breath away. It is impossible to walk into a gallery and miss it for the sheer size and impact in each piece. I first met Arina when we particpated in the Art Liberating Lives Exhibition in 2008 raising funds for the Sue Ryder Charity. That year sArina had won the Anthony J Lester Art Critic Award at the SWA Society of Women Artists Annual Exhibition. I could see why. You can admire her amazing collection on a video via this link. In 2009 I followed in Arinas footsteps when I submitted to the SWA for the first time,had all six paintings accepted and my work was selected for the Anthony J Lester Art Critic Award. I was thrilled for so many reasons because I am so passionate about watercolours. I work hard with style and technique and to recieve this accolade for my own paintings was overwhelming. And I am very honoured to follow artists like Arina who deserve such recognition. In person Arina is wonderful, her art has to be seen to be believed as on the screen it somehow misses the beauty it holds in reality. So my post this Sunday is a tribute to a wonderful friend who happens to be an artist with amazing talent. Arina...it is an honour to know you and call you a friend. I wish that 2010 be a real success for you as in my heart I know it will be. Following my leap back into action paintings I spent a wonderful session in my studio yesterday creating this racing scene. From a few placements of pigment while working with a sense of excitement figures rapidly began to appear. As I worked away from my main rider I really had to depend totally on my imagination to allow the scene to come to life. At this stage I didn't want to be "dictated to" by what I saw. I had the desire to paint what I felt instead which is a far more powerful way of creating. From my soul as an artist.
" Taking the Lead " First Stage. Even now there is so much of the story already told. Why does this painting work? I knew from the beginning it would bea good result because I could see the finished piece in my mind. It isn't enough for me to look at an image and want to paint it. I want to capture the very essence of every single thing I am working on and bring it to life so that viewers of my creations feel they are involved in each scene. 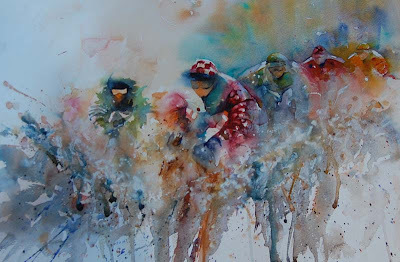 In this painting I want them feeling as though they are there at the races. I want them guessing who will win and almost hearing the noise of hooves on the ground creating a flurry of mud and dust rising from the movement and speed of the racing. This is an exciting scene to witness in reality. Therefore it has to be an exciting scene in a painting. It has to be rich in all aspects.Colour,brushstrokes,composition,technique. Everything has to work. And for me in this piece it does. I am happily working on a new collection and really loving the series! By the way, I really think the rider in green on the outside is about to take the lead, take a look and see if you agree! When everyone expects me to share paintings of Spring Flowers or cockerels it really is nice to do my usual of being " unusual" by throwing in an unexpected subject. It feels very suitable to share this painting which started as a study last night. My life feels like a blur at the moment as I juggle so many projects constantly. My March Exhibition in Alton is now prepared but I am working on new collections for another gallery and a special show later this year. I am also working on my second book . I jump from subject to subject at will as my heart leads me and enjoy the variety of colours in each. This painting holds excitement for me and the sense of movement that is necessary to bring it to life. Working without a preliminary sketch means my focus really is on colour and how it interacts. Techniques are vital to create variety throughout the composition so that the viewer can really fill in gaps with their own imagination. I can just see the horses muzzle although this isn't painted. I can feel the speed at which the horses are moving even though they aren't even there and the steam from the heat of the animals as their breath hits the cold air all adds to the thrill of the race. I am racing to fulfil my commitments today and possibly this feeling is entering my work. A complete change from painting flowers to peaceful calm lyrics! In life we are often faced with making decisions. Many on a daily basis. Some are far more important than others. In my studio I have a wonderful collection that is growing constantly with new favourite paintings. I have several exhibitions and galleries which I will be delivering work too in the next few weeks. I am also moving into a renovated old cottage in Spring which has an owl house on a beautiful log cabin which acts as a garage. I will be wanting to hang my favourite paintings in my new home. This is one. 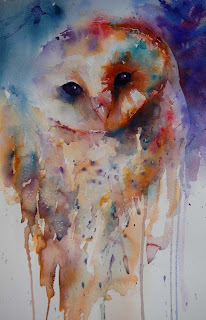 I started painting owls recently and the pose on "Too Wise" has appealed to me ever since this subject first started appearing with my brush. There is a softness in the feathers that catches my attention. The eyes shine with eager alertness that you would expect from these birds.And that beak somehow has a magic I can't define. It is a special piece. My heart tells me to keep it but my artists choice is to exhibit for others to enjoy. In a frame this looks so different and my heart will be torn yet again when I see this hung but it will be part of my Spring Show. I have made a wise decision. But I will silently pray no one buys it and if they do I pray they will be a very special buyer. How attached we all become to our work. Our emotions combine with our brushstrokes and our feelings often show in our paintings. I will always aim to make wise decisions...and I will always love this owl. Market Street Gallery, Alton,Hampshire, U.K. Private Preview Invitations Available from the Gallery. Preparations are now well under way and the Spring collection is looking really beautiful. Whilst the workshops are already fully booked I will be at the Private Preview prior to the official opening.There are a few invitations available for this event so please contact the gallery directly if you would like to come. An experience on a scrap of paper destined for the bin when I started. Last week I bought a spray of lilac to work from in my studio. I paint from life finding light is more magical to capture from reality than when working from photographs. This could be why there is a huge variety of colour in my work. I see "real" colour not the flat darks often found in digital images. 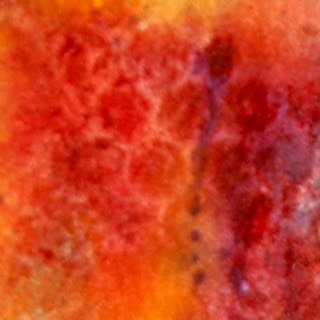 To relax and close a studio session I placed colour on a scrap of old paper allowing it to flow . Then began to pick out lilac shapes. I soon became mesmerised by the tiny flowers in each lilac form. The scent was so intense I almost began to feel I was aiming to capture the perfume which was rich and dramatic rather than light and soft as the blossom. This piece was painted deliberately for the bin. It had served its purpose into introducing me to wonderful colour combinations for the serious paintings and I discovered composition suggestions for a series also. However when I shared this with others the feedback was glowing. One of the main setbacks when we look at our own work is we often see what we were aiming for. Not what we achieve. Others only see the results and only focus on this. If only we could see our work through others eyes.See what they see and feel. Then we too may just see the beauty! 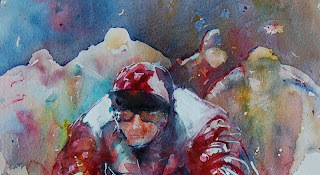 Working on a second book is opening my eyes to techniques to create movement and life in watercolour. I have a feeling of even greater excitement as I explore new ideas. My studio seems to be a haven with an assortment of products and items I have never even thought of using before and some I had forgotten about. It will be a wonderful way to share a different approach to painting.I also smile knowing this second book is going to contain quite a few surprises. It is wonderful to be able to share the behind the scenes thoughts before this one hits public attention! Yesterday I delivered the last of the collection to the Market Street Gallery for the Spring Exhibition. Looking at all the pieces together I know it will be a really colourful show and I cannot wait for the Private Private Preview. Many artists will understand the need for working ahead so I am now working on future exhibitions and I have a few charity projects I must complete also. To be able to support others by way of my brush is a vital part of my work and personality. At the moment five charity events will each recieve a very special painting and will take place throughout the year. I have time to work on each individually to ensure funds raised really do help. I never take for granted my own health or life style. I am able to see, feel and use both hands. I also was somehow blessed with this passion for working in watercolour. I honestly believe this kind of passion is a gift which is best appreciated if it is shared. All gifts are all the better if they can affect orthers in a positive way. Sharing whether it is a smile or an act of kindness is like a ripple on a pond. It spreads and can do great things. It is Monday morning and you have a million and one things to do. Two very excited dogs are eager for their walk on which you prioritise the order of events for when you return to your studio which has already been invaded by the family cat. You gently move the cat off your desk and in minutes move them away from your water container which they seem to believe is there solely for their drinking purposes. You patiently move the cat off the keyboard as you aim to complete the mornings administration. Paintings are then selected ready to be delivered to the gallery for an exhibition and it is time to add any last finishing touches to your latest collection. All the time you are mentally working on your list of necessary things to do. 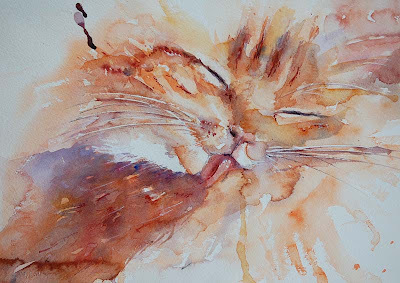 You patiently pick up the cat and remove it from your palette where it has managed to gain different shades on each paw which are now casually being walked all over the clean sheet of watercolour paper you had placed on the floor next to the easel to be used during the mornings session. It has now become an abstract. Maybe a piece of modern contemporary art. There is only one painting left to complete before you leave for the trip to the gallery and the model happily co operates by washing immediately in front of the easel! The dogs are finally sleeping, there is peace at at last and the cat? A typical Monday morning with a wonderful cat in glorious shades of gold capturing my attention taking my mind away from the task in hand. Preparations for my March Exhibition at the Market Street Gallery in Alton,Hampshire. Please contact the gallery directly for invitations to the Private Preview where I will be meeting guests during the evening. As I wake this morning I think of all the cards and flowers that will be given all over the world as a way of showing how much love is shared between two hearts. Young girls will hope to recieve cards from admirers, lovers will find ways to show each other how much their relationship means, couples will show how strong their feelings still are even after many years of living together. And there are those who will treat this like any other day. And there are those who would give anything to share just one more moment to say " I love you"
Earlier this year I was asked to donate a painting for a very special auction. I chose "Femme" . She was in a beautiful antique frame and had a sense of calm about her. Please allow your own feelings to imagine what this figure is thinking. Is she a lover? Has her lover just left or is she waiting for him to arrive? Maybe she is a loving wife. Maybe an artists model. She started to appear during an art session and the point where I stopped was where the session closed.She was placed on my easel and I soon understood any further brushstrokes could hinder not add to the story she was telling. And so she was framed and I later decided she would be part of my private collection until I received the charity request. As the artist I see her turning her back on all of her troubles and looking forward to something so beautiful and very private. Maybe her lover or husband taking her into his arms. The golden light in the upper right corner signifies happiness yet to come. The red in the lower left corner signifies the colour of love perfect for St Valentines Day. This morning as I wake in my loved ones arms I realize how lucky we are. I have a romantic evening to look forward to with an element of suprise as I haven't a clue where I am being taken. Like the girl who fell in love years ago I feel as though I am going on a date. I have a new dress to wear which is feminine and romantic. I am still very much in love. I know how lucky I am to openly type that line. And for a moment this morning my heart thinks of those who can't be with loved ones today for whatever reason. My wish this morning is that everyone who is lucky enough to have someone in their lives will show them just how much they are loved because our tomorrows can never be taken for granted. From a collection of my earlier portraits. When I returned to UK from Dubai and Hong Kong it took a while to settle. Renovations on an old country house took so much of my time and I also became obssessed with renovating an old country garden. I took a break from a hectic professional art career and enjoyed life to the full. But my heart wouldn't settle without a brush in my hand.The demands on professional life are great if you are a successful artist.The days where you pick up a brush simply to paint are gone.You have administration to deal with,a diary to organize years ahead and you need to be on top of juggling so many projects and invitations to exhibit. 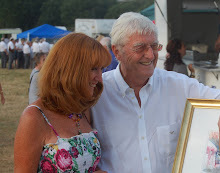 During this time I was invited to the Felpham Art Trail in Sussex. On my very first visit I met so many fantastic people and artists. From there my participation turned into annual events when possible with each year seeing my growth as an artist and giant leaps in my career. I always came home feeling rejuvenated and even more inspired. I now even look at the trail as my " lucky charm" because following these breaks by the sea I always seemed to have fabulous new opportunities flying my way. My favourite memory is of my first visit when I met a very proud Grandfather. I was demonstrating a childs portrait at the time and he offered to show me images of his grandson. I fell in love with the sweet face immediately and this child has been a favourite subject ever since. My first painting of Jacob won " Best Painting in Show" at the Farnham Art Society Autumn Exhibition of that year. I give favourite paintings like the one above to the Grandfather as they couldn't possibly be loved as much by anyone else and I am grateful for the wonderful inspiration. I strongly believe in giving back in life whenever you are blessed to have met someone who has influenced or been kind to you. 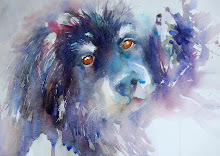 This year I asked permission to use Jacob in my first book on watercolour. My wish was granted but when the book started evolving something magical happened. I decided against using Jacob but the Grandafther may have a surprise because he is in it ! I looked at my first book yesterday and at times still can't believe I painted all the images or wrote all the text. I even made a remark to my publisher "Did I really paint that?" which makes me laugh this morning. I know wihout a doubt even if this wasn't my own book I would buy it. I would want to own it and I am so happy to be able to type that line. From start to finish I can see why certain techniques came to life over the years. I have grown so much and I look at the above painting of Jacob and easily see how far my journey with watercolour has come. The above painting looks very different to how I paint today but how thrilled I was when I created this without a pencil for the very first time. No preliminary sketch at all with this piece.Just colour building up in layers to create the face. You can read more about the Felpham Art Trail on this link. My world is coming alive with wonderful Spring flowers. 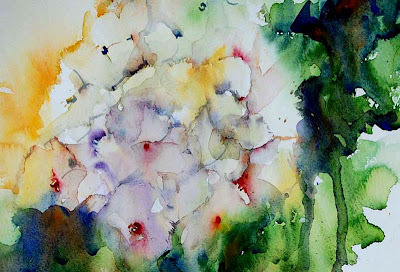 I am tempted each day to paint daffodils,snowdrops and primroses. I set up my working space in my studio every evening with some arrangement to dream about and to entice my brush in the morning. On my facebook page I asked a question.Which are your favourite yellow shades.The replies were varied and interesting so I thought I would share mine and set a wonderful challenge at the same time. 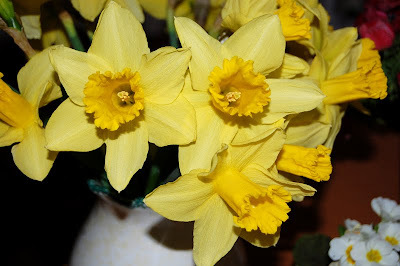 How about brightening March on facebook and blogs by sharing brilliant sunshine and a host of golden daffodils? 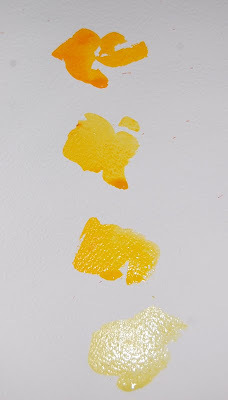 Here are the yellow shades on my palette. 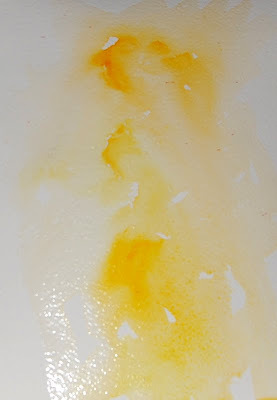 Winsor Yellow is a favourite of mine! Next I have placed swatches of colour on a scrap of paper. For me this is a wonderful way to start the day with fresh clean colour simply playing. Some tubes could get neglected in my materials box if I didn't use them all regularly. Can you see where this experiment with colour is heading? I am raring to go and eager to pick up my brush now.............and I know which colours I will dismiss and which new ones I will try! March 1st is St Davids Day in Wales where I am from. The dadffodil is our national flower.......I would be thrilled to see a world full of daffodils shared on this day in any medium all over the internet! The race to paint a million daffodils is on! Please invite your freinds to join in too. In my first book "How to Paint Colour and Light" in watercolour I introduce exciting ways to paint minus the use of a preliminary sketch. This simple and fresh approach really can turn into an addiction in wanting to try to capture every single thing you see in this loose style.......please be warned,this really can be a very addictive way of painting! It has been an incredible week. As I mentioned in a previous post a form of fear set in prior to my cover being released. I laughed at first because I wasn't expecting these emotions but the mild fear gradully turned to complete panic as the day grew nearer when I would be showing the cover for the very first time. Friends were eager to see it and all over the world artists who had asked me to write were also nudging my arm for a clue as to when they could finally see what I had been working on. I shared the cover on facebook and my blog and almost felt like hiding which is absolutely ridiculous! This is when being connected with artists from all over the world helps. I came in touch with Nita Leland on facebook and confessed how I felt. This very wonderful artist not only took the time to listen and reach out. Nita understood my feelings. She gave me that extra confidence with wonderful words of encouragement and from here I shared the cover details. My book was out there for all to see and hear about with a helping hand from an already highly successful author. Please take a look at Nitas blog and her work. Her fabulous personality shines and it is because of this artist many of my friends actually finally got to see the cover of my book! Now I am sat here with the final proof of my book. There seems to be always one more " final proof" ! I am told this really is it. The last chance to change anything as it is ready to go to print now and be on sale. It has been to the professional proof reader prior to its release and it has also been to the design team for approval in the layout. My recent meeting covered this aspect and it is interesting to see my ideas come to life on pages instead of a workshop! Being in the hands of a successful and professional publishers is essential when entering the world of writing. My leap into being an author has been the most exciting of journeys and I hope from sharing I may inspire other artists to fulfil their dreams. I have this last chance to change my book before you see it. I am trying to see it through your eyes. I can even name people who will be jumping up and down with happiness because of whats inside......these will be thrilled because they have what they asked me for. And I have tried so hard to please everyone! I will close this entry with a heartfelt thank you to Nita. We all need someone to turn to at times and for me Nita ,already a star in the art world is now my " Author Angel" for being there ! Thank you so much Nita. As an Associate Member of the SWA ,Society for Women Artists I thought it would be a great idea to share members news. "Founded in 1855, the society has had a unique history dedicated to promoting art by women. The Annual Exhibition at the prestigious Mall Galleries, The Mall, London, SW1, showcases a stunning and eclectic mix of artwork in all media. The Society encourages variety and versatility and features some of the finest contemporary women artists from all over the world, thus sustaining a reputation for excellence"
A simple telephone call can turn into a creative few minutes if scraps of paper are at hand. The childhood habit of "doodling" is evident even when I am on the phone especially when I am having a light hearted conversation with a close friend. When working on serious paintings I shut myself in my studio and avoid any interruptions.But there are times when it is fun to take a break. I think this collection of colour really does reflect the warmth and personality of the friend who had called me.The light really does reflect my mood. Carefree, happy and so full of the joy of new life that surrounds me this Spring. I love how granulation creates texture interest and the way a mixture of pattern edges give the loose interpretation of flowers. 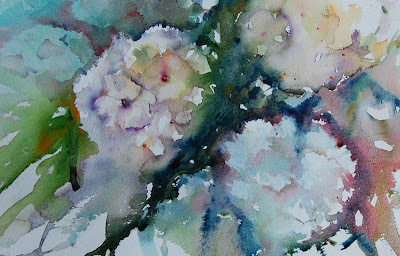 As primroses sit on my studio desk in a pretty pot they are the main influence. I paint what I see as well as what I feel. Emotion is in this small piece as my feelings for this particular friend shine so brightly. She is caring, genuinely warm and full of spirit. Our paintings reflect our personality. Mine is gentle which often is evident in my brushstrokes. I feel I have captured the colour of friendship in this unfinished piece. And what a wonderful way to pass the time with a friend even if it is via the phone! 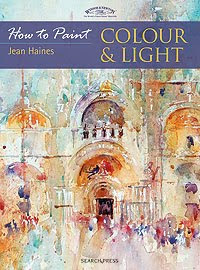 My first book "How to Paint Colour and Light in Watercolour" is now available to pre order from Search Press. It is packed full of information on how I work, see, think and bring techniques into my paintings with influences from my travelling. 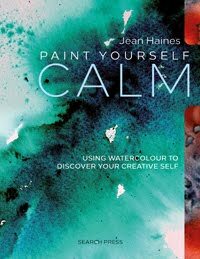 "A stunningly beautiful book that teaches you how to produce loose and expressive paintings, filled with colour and light. 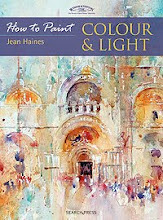 Encapsulating Jean Haines' enthusiasm and passion for art, this stunning book, packed full of ideas, tips and expert advice, opens up a whole new world filled with colour and light that will not fail to inspire and excite you. 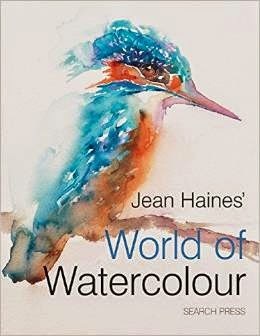 Drawing on many years' experience as an accomplished and well-known watercolour artist, Jean guides you through every stage of the painting process, filling you with enthusiasm for painting beautiful watercolour paintings of your own in her characteristic loose and expressive style. 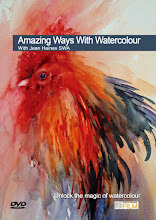 The book includes sections on materials and techniques, composition, colour and light, and there are three step-by-step projects to help you put everything you have learnt into practice. 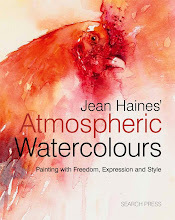 The huge range of subjects covered, including portraits, still-lifes, animals, flowers and landscapes, has a truly international flavour, reflecting the experiences Jean has gained from living all over the world." Monday,My Blank Piece of Paper.